Be the first to share your favorite memory, photo or story of Sam. This memorial page is dedicated for family, friends and future generations to celebrate the life of their loved one. 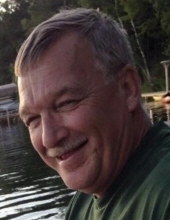 Sam Jack Sommerfeld, age 63, formerly of Parnell, passed away Tuesday, November 20, 2018 at the Marshfield Hospital. He was born on June 25, 1955 in West Bend, WI, a son of the late Kurt and Fanny (Saarloos) Sommerfeld. He attended West Bend East High School. On September 13, 1996, he married Amy Chapman in Juneau, Alaska. The couple resided in Parnell following their marriage where they lived the past 32 years. Recently they moved to Park Falls to enjoy lake life. He was employed at Vollrath in Sheboygan for 32 years before retiring in 2018. He enjoyed fishing, riding motorcycles, working on cars, good food and family time. Survivors include his wife, Amy (Chapman) Sommerfeld of Parnell; three daughters: Val King of Campbellsport, Samantha (Ron) Murchek of Flower Mound, TX and Kate Sommerfeld of Parnell; Son; Chad (Jaime) Sommerfeld of West Bend; Five grandchildren: Ella Sommerfeld, Mya Sommerfeld, Rachel King, Hannah King and Riker Murchek; Brothers: Max Sommerfeld of West Bend, Mike Sommerfeld of Elkhorn. He is also survived by: In-Laws, nieces, nephews, other relatives and friends. He was preceded in death by Sister: Donna Weidman and Brother: Mark Sommerfeld. Following Sam’s wishes, cremation has taken place and a Memorial Service will be held on Saturday (November 24, 2018) at 12 Noon at the Suchon Funeral Home in Plymouth. Pastor Dale Miller will officiate. Visitation will take place at the Suchon Funeral Home on Saturday (Nov. 24) from 10:00 A.M. until the time of service at 12 Noon. The Suchon Funeral Home and Cremation Services of Plymouth is assisting the family. For online condolences, please visit www.suchonfh.com. To send flowers or a remembrance gift to the family of Sam Jack Sommerfeld, please visit our Tribute Store. "Email Address" would like to share the life celebration of Sam Jack Sommerfeld. Click on the "link" to go to share a favorite memory or leave a condolence message for the family.